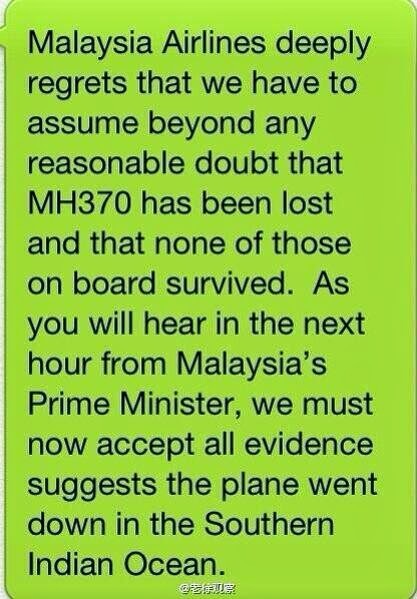 The news in a few hours ago RE: the Malaysia Airlines missing flight MH370, and it's dire and not what anyone hoped, but sadly, what most of us expected: flight MH370 has gone down, and there are no survivors. A new, unprecedented satellite tracking technique is what gave Malaysian Prime Minister Najib Razak enough confidence to announce that Malaysia Airlines flight MH370 went down in the remote south of the Indian Ocean. It's brutal, it's upsetting, it's a mechanical, robotic delivery, devoid of emotion. It's not the way you want to the told the news you dreaded. I have to wonder though, how should the families have been told? By phone, one by one? That makes sense, yes. But who gets told first, who will be delivering the news? Upon delivery, the questions and extreme grief ensues. I don't know that the text message is the problem - it's just the tipping point of how the whole thing was handled, from beginning to end. And really, this is just the beginning of the grief. It's all manner of devastating, every single part of it. Updated: Sydney's Nine News bulletin has resorted that most families were contacted by telephone and when some were uncontactable, they received the news by text, above. Again, all of it is deeply sad and upsetting, and none of the news is good.